US-based Daniel Lopes, Joshua Kalekyezi, Jamal Goodluck and Oswin Coggins were among the winners on opening day of the 8th Edition of the GBTI Open Tennis Championships which served off last Friday, at the Bank’s Recreational facility, Bel Air. Lopes squared off against Jordan Beaton, who started strong and had occasions to take the first set, but failed to fend off the 6-4, 6-3 defeat. Kalekyezi defeated Surendra Khayyam 6-0, 6-2, while Goodluck beat Adesh Khayyam 6-0, 7-5. Ronald Murray defeated Alexandre De Almedia 6-1, 6-1 to set up a clash against Andre Erksine, who looked lethal in his 6-0, 6-0 demolition of Khalid Gobin. Rorima club mates Coggins and Devon Gonsalves battled each other in a tight match. It was to the astonishment of spectators the level of growth Gonsalves had made since his GBTI novice debut last year. He tussled with Coggins and displayed exceptional touch at the net, but was unable to maintain his focus in crucial points allowing Coggins to impress with his style of play and eventually prevailed with a 6-3, 7-6(7/3) win. Khawn Rodney had his challenge against the household name Rudy Grant. It was the joy of the tennis family to see the effort and love for the game displayed by Grant. Knees strapped and passion untamed as he pushed physically against the hard hitting forehand of young Rodney. Kalyca Fraser, who has been one to watch, defeated former President, Grace McCalman 6-2, 6-1. Meanwhile, Saturday night primetime had epic matches that lasted until midnight. All eyes were focused on Nicholas Glasgow vs. Sandeep Chand and Alexey Almedia vs. Albert Razick matches. Glasgow showed confidence from the strike of the first point against a fearless Chand. He was able to pull off a 6-4, 4-6, 6-1 win because he was able to utilize his weapons of a big forehand, low slices and consistent play which led to a variety of shots. Chand was able to lift his game in the second set, but was never allowed to take that momentum into the third. 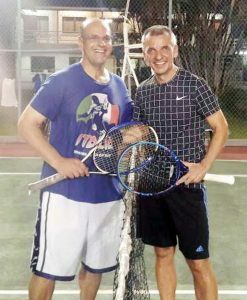 Members of the Diplomatic Corps, Brazilian Almedia and American Razick had a match of class, sportsmanship and quality tennis that lasted over three hours and thirty minutes. The senior players made full use of the court strategically and were examples of mental toughness. However, Almedia was able to get the upper hand to defeat Razick 3-6, 6-1, 6-4. In the Boys round 32, Dominic Skeete defeated young Buxtonian, Tyrese Trim 6-2, 6-4 after meeting twice in less than a month, while on the girls’ side Kalyca Fraser marched into the semi-final after handling the upcoming junior, Sekai Jones. Alana Chung made her way pass Charlese Adams 6-1, 6-1, while Sarah Klautky confidently dismissed Margaret Subryan 6-0, 6-0. Nathalie Ramdyhan looked sharp against her best friend, Ciara Pooran as she also booked a semi-final spot at 6-4, 6-4. Matches continue throughout the week at the same venue, starting from 17:00hrs.